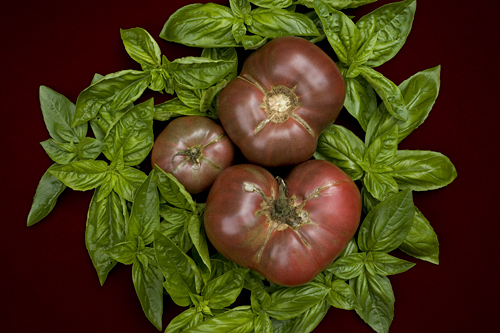 Cherokee Purple – Tomato Town organically grows heirloom tomatoes in the greater Kansas City area as well as Johnson County, Leawood, Lenexa, Olathe, Shawnee, Merriam KS, Independence MO and Kansas City Missouri, KCMO. Varieties include: Cherokee Purple, Brandywine, Stupice, Carbon, Black Krim, Black Cherry, Yellow Pear, Absinthe and Aunt Ruby’s German Green. According to heirloom tomato lore, in the early 1990’s, Craig LeHoullier received a packet of seeds from John Green of Sevierville, Tennessee. Green said the seeds were from a purple tomato Cherokee Indians gave to his neighbors 100 years ago. Through the years, Cherokee Purple’s siren song of sweet taste and strong yields have lured many a gardner down the heirloom path. We love the dark flesh and the amazing taste and wholeheartedly agree that this is one variety that TomatoTown cannot do without! This entry was posted on Friday, July 8th, 2011 at 9:51 am. It is filed under TomatoTown Favorites, Varieties. You can follow any responses to this entry through the RSS 2.0 feed.